Wear the acid wash trend now with these super fashionable skinny fit denim shorts. They have an acid wash pattern and are available in a light bleach, dark bleach and red bleach. 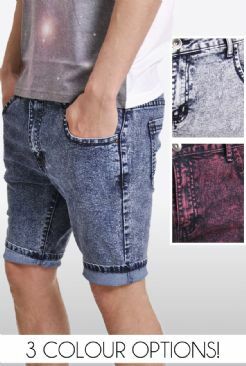 These are great shorts and for such a good price they should definitely be a wardrobe staple this season! (Model is a waist size 32 and wears a size medium). 68% Cotton 21% Polyester 10% Viscose 1% Elastane Not Sure Which Size Are You? View Our Size Guide!